WHO TO HIRE FOR WOOL CARPET CLEANING? One of the highest quality carpet fibers is wool. If you buy wool carpet for your home you want to be sure it is cared for properly so it last for a long time. How do you know who to hire for wool carpet cleaning? Be careful hiring cheap carpet cleaning services for wool carpet. You made an investment in the beauty and quality of your floor so you should continue to invest in it and avoid cheap services or solutions. We do not recommend rental carpet cleaning machines for wool carpet. Rental machines use too much water and chemicals that could bleach or damage the wool. We do not recommend services that advertise extremely low prices for their carpet cleaning. These services are likely not qualified for wool carpet cleaning and could damage your wool carpet rather than clean it. The best thing to look for for hiring a wool carpet cleaner in Fort Wayne is if the company is WoolSafe® certified. Go to the carpet cleaner’s website and see if they advertise being WoolSafe certified or call the company to ask them. If a carpet cleaner is certified then you can trust that their service is safe for your wool carpet. WoolSafe only certifies carpet cleaning companies that use recommended processes and equipment for wool. You have to be careful with wool carpet because it is a natural fiber and not synthetic. That is why it requires special certification. Chem-Dry of Fort Wayne offers certified wool carpet cleaning from the WoolSafe organization. We are proud to be able to provide a service our customers can trust in and confidently call for when their wool carpet needs to be cleaned. Learn more about our services here. 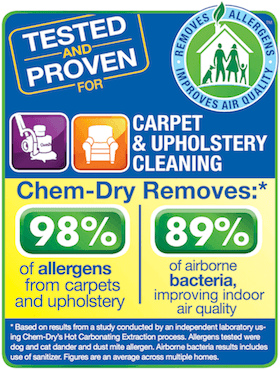 To schedule an appointment with Chem-Dry of Fort Wayne for wool carpet cleaning or furniture and upholstery cleaning, call (260) 409-1138 today!